Dried cherry stems a very healing plant, the health benefits of cherry stems include a plant that has benefits against prostate hypertrophy which causes balance urination, increases in edema during menstrual periods of women, as a toxin remover, against circulation disorder, urinary incontinence due to urinary obstruction of bladder. Preparation of dried cherry stems tea as follows; 1 large cup of cherry stems tea for 1 tablespoon of dried stem can be used. After pouring boiled water into glass with cherry stems, you just have to mix for 5 minutes. Is beneficial to the kidneys. Helps to remove excess water from body. Good for urinary tract infections. Dried cherry stems has own unique chemical structure and excellent biochemistry. It has a regular and distinctive cellulosic structure that is not complicated. The lack of active substances and independence make very powerful if you use for therapeutic purposes. Cherry is the most common feature known to throw water from body without adversely affecting salt balance. Throws water from body and dilutes blood. It is a friend of our veins. Cherry stems allows to work more comfortably of heart. This feature is very rare in fruits. It is very strong preventive power against internal lubrication of veins. In the morning, a handful of cherries to be consumed in empty stomach bad cholesterol creates a shield all day long against negative effect. It is effective balancing and in lowering triglycerides and cholesterol. It is wrong to think, “I have consumed a handful of cherries, I did not need to attention to what to eat during day “ There is no one who does not know dried cherry stems tea. However, the earliest age to be used in men is forty and later. Young women can apply dried cherry stalk cure at the earliest fifteen years of age. 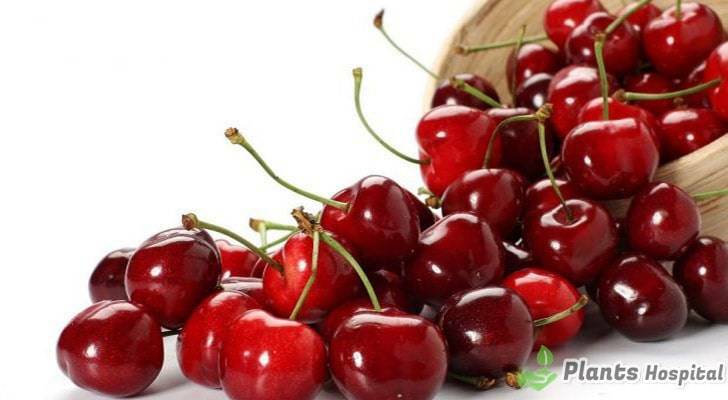 You can find in the title “benefits and use of cherry stems against edema due to menstrual” how and in what circumstances the women can apply dried cherries in general. 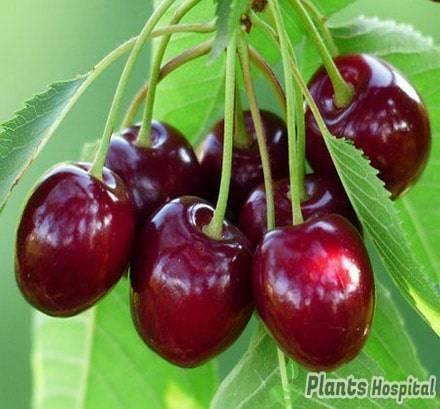 Cherry has a great effect on eliminating prostate complaints. However, as a cure alone, is not effective against prostate complaints. It should be used together with a second plant. Many women suffer from swelling in bodies. The easiest way to get rid of this aesthetically annoying situation is dried cherry stems. Boiling and drinking cherry stems facilitates both circulation and excretion of toxin, as well as destroying swelling in body. 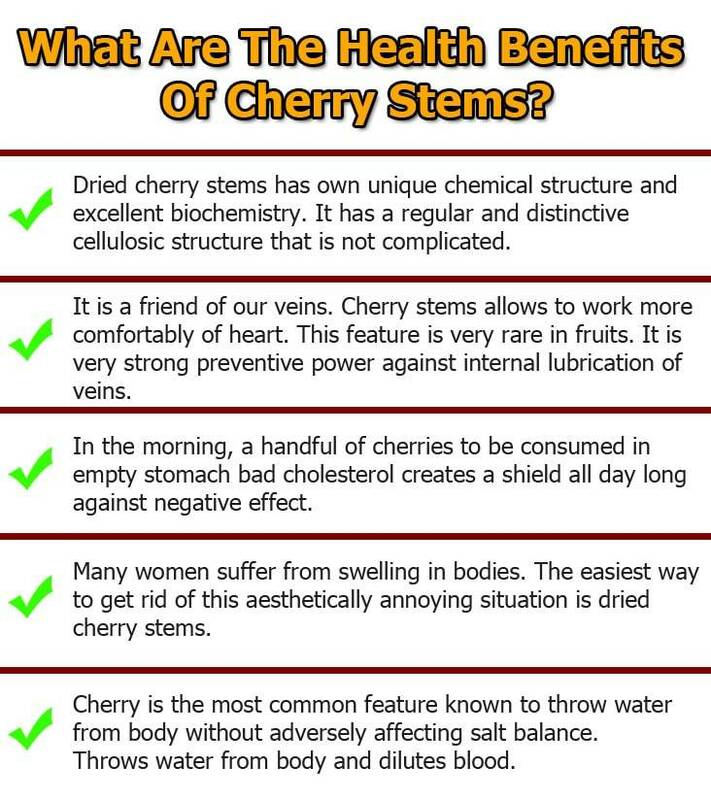 Cherry stems cure is effective against edema of menstrual period and has little effect on organ or tissue edema. How to Make Cherry Stems Tea? In a saucepan, pour about a handful of cherry stems into a liter of water. Boil in a low heat for five minutes. After cooling, filter and fill in a bottle and protect in refrigerator. Empty or full stomach drink a glass of water every day during period of menstrual cycle. Prepared cherry stems water can wait three days in the refrigerator. Do not use increased amount after three days. If necessary, prepare again every three days as fresh. If the cherry handles you bought are dusty, you can wash them in cold water. Never wash in hot water. In a saucepan, pour about a handful of cherry stems into a liter of water. Boil in a low heat for seven minutes. After complete boiling period, filter without waiting for to cool and fill in a bottle and protect in refrigerator. Drink only one glass of water a day, half an hour before meals or two hours after meals. After one week of application, three days break is taken, one week is applied again and then the cure is terminated. Prepared cherry stems water can wait three days in refrigerator. Do not use increased amount after three days. If necessary, prepare fresh again in three days. If you buy cherry stems dusty, you can wash in cold water. Never wash in hot water. This recipe for swollen eyes and tired feet; 4 Pinch cherry stems 3 liters of water 10 minutes boil. When boiling, add 20 grams of cinnamon and 5 grams of Linden (15-20 leaves). The bath you will use with this mixture will breathe into your skin. Put this mixture in a bowl and let stand for 20 minutes. You will notice that you are relieved of your pain and your beautiful feet.